Selod’s research examines the Muslim experience in the years after 9/11. Specifically, she looks at American Muslims’ experiences with discrimination that are incurred upon them through their surveillance by the government through policies and upheld by private citizens. 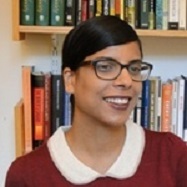 Her research also focuses on the idea that Muslims are a threat to national security and American values. Saher Selod quoted on anti-Muslim discrimination in Marguerite Ward, "Muslims Face 'Toxic' Environment in Wake of California Attacks as Islamophobia Escalates in U.S." International Business Times, December 6, 2015. "Growing Up Muslim in America," Saher Selod, Interview with Anna Fifield, Financial Times, July 19, 2013. "Criminalization of Muslim American Men in the United States" in The Immigrant Other: Lived Experiences in a Transnational World, edited by Rich Furman and Alissa Ackerman (Columbia University Press, forthcoming). Examines how Muslim men have been criminalized and racialized in U.S. airports. Forever Suspect: Racialized Surveillance of Muslim Americans in the War on Terror (Rutgers University Press, 2018, paperback 2018). Shows how a specific American religious identity has acquired racial meanings, resulting in the hyper surveillance of Muslim citizens. Investigates how Muslim Americans are subjected to racialized surveillance in both an institutional context by the state and a social context by their neighbors and co-workers. Underscores how this newly racialized religious identity changes the social location of Arabs and South Asians on the racial hierarchy further away from whiteness and compromises their status as American citizens. "The Racialization of Muslims: Empirical Studies of Islamophobia" (with Steve Garner). Critical Sociology (2014). Examines the theoretical concept of racialization and its utility to understand experiences with Muslim populations in Europe and the United States. "Citizenship Denied: Racialization of Muslim American Men and Women Post 9/11" Critical Sociology (2014). Compares Muslim American men and women’s experiences with discrimination post 9/11, highlighting how they are often viewed and treated as un-American. "Racialization and Muslims: Situating the Muslim Experience in Race Scholarship" (with David Embrick). Sociology Compass 7, no. 8 (2013): 644-655. Argues for the need for race scholarship to engage with racialization literature in order to understand the Muslim experience as racial.